Happy birthday Craz-E. Yes, the Ping Craz-E putter is celebrating its 10th birthday. To mark the occasion, Ping gave the eye-catching head shape a Scottsdale TR makeover. 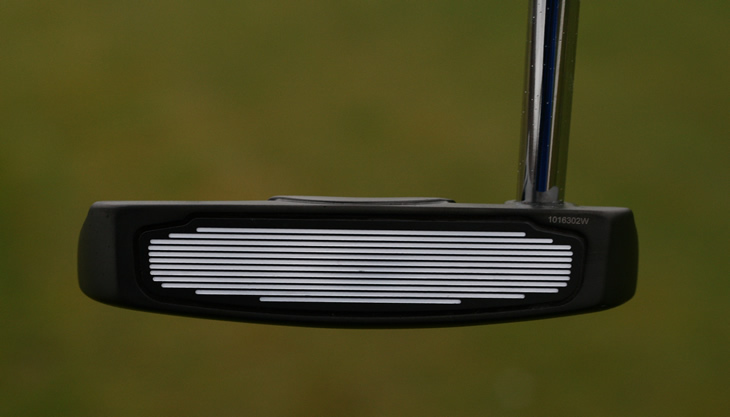 Along with 14 other models, the Scottsdale TR range will be Ping's headline range of putters in 2014. By my count, the Ping Craz-E has had more image changes than Madonna. I can recall the iWi, g2i, G5i, Z, Ladies Faith, Karsten 1959 and Jas Craz-E Moment versions of the now-popular design. Despite its clear success and heritage, the Craz-E model wasn't part of the original Scottsdale TR range. Six months after launching 12 models, Ping added three more models to the Scottsdale TR range, including the Craz-E.
We got our hands on the latest edition of the Craz-E, the first with Ping's TR or True Roll face technology, and put it through its paces. Like the entire Scottsdale TR range, the black finish on the head is simple, understated and creates a sharp contrast with both the ball and the white alignment line on the rear of the head. Personally, I am not a huge fan of shiny chrome or copper finished putters, so the dark look at address sat well with me. Whilst 11 of 15 of the Scottsdale TR models are designed by Ping to suit to a specific stroke type of straight, slight arc or strong arc sroke, the Craz-E matches up with all of them due to the choice of three hosel designs. Many will see the look of the Craz-E and think "here's another oversized, heavyweight, high-MOI putter" that is far from the traditional look they may prefer. However, they would be wrong. Whilst it is indeed a high-MOI putter, with weight moved back and away from the face, it is not all that heavy or oversized. It is considered a mid-mallet in terms of size and surprisingly at 365 grams it weighs just 15 grams more than the Scottsdale TR Anser model. 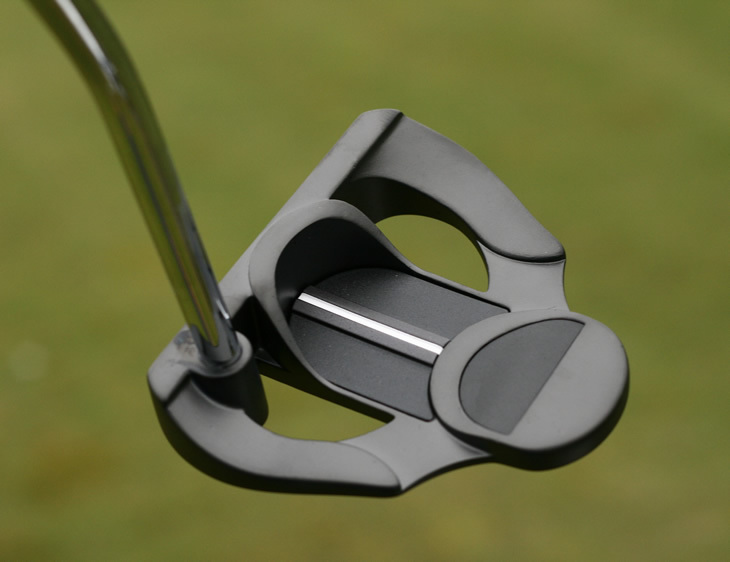 Several aspects of the Craz-E design lead to this being a very stable feeling putter. First is the shape. It may not be everyone's cup of tea, but this is very much a case of function over form. Behind the straight leading edge, the head design is stretched back, adding material to the toe and heel portions as well as back and behind the face. The idea was to move the centre of gravity away from the face and limit the tendency for the putter to twist, open or close at impact. It’s kind of crazy looking for us, but it performs to our high standards. 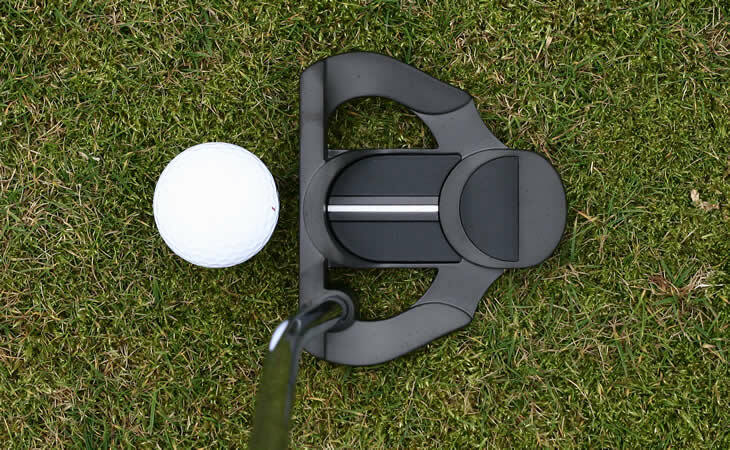 We’re confident the putter’s performance and unique look will result in a lot of golfers making a lot of putts. A subtle way in which Ping were able to add stability to the Scottsdale TR range was the grip. Rather than the thin, Tour-preferred grip, featured on the Anser Milled range, the Scottsdale TR putters are fitted with a black, corded midsize Golf Pride grip (left below). Whilst is it is only marginally larger than the standard grip, you can really feel the difference in your hands. Ping say the size is designed to "keep the wrists firm and ensure a stable stroke" and having used it several times, I would have to agree. 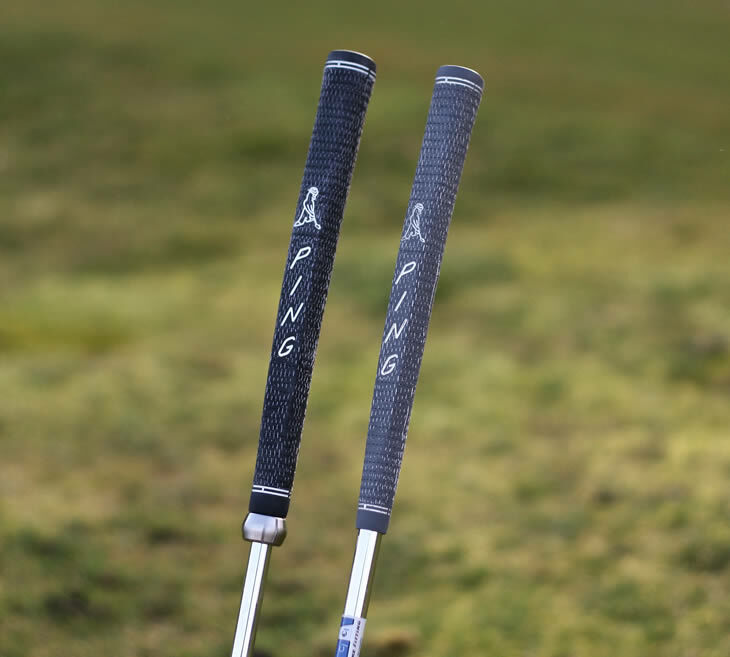 Much like oversized grips are becoming more popular, both on Tour and with amateurs, Ping are adjusting to what players want and what will help with their strokes. It is also worth noting that the Senita B model in the Scottsdale TR range is also available with a 17-inch long, counterbalanced grip, featuring a 50-gram weight on top. Another feature, designed to create a more consistent performance, is the TR or True Roll face technology. The variable-depth grooves work to lift the ball from where it rests and consistently roll it towards its target. The grooves are shallower near the toe and heel of the face and deeper in the middle. Ping say the TR face increases ball-speed consistency by nearly 50% when measured across nine different points on the face. Unlike the grooves that used to be more focused on the centre of the face, the TR face insert is larger and spread wider across the face. I preferred this both in terms of performance and appearance. So did it produce a True Roll? In short, yes. 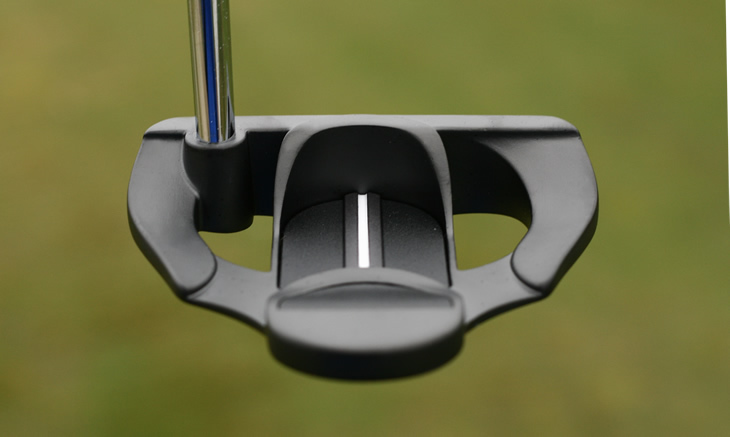 The feel is certainly softer than many of Ping's more traditional, milled-face putters. Along with the head shape, the grooves on the face did produce a very consistent feel and result, even when I struck putts off both the toe and the heel. Distance control on mid and long length putts was impressive. Often when you are faced with a putt over 20ft, you don't always strike the putt perfectly. That made very little difference with the new face. there is little doubt that all off-centre strikes, on any putter, will suffer but the discrepancy certainly felt reduced with the Scottsdale TR Craz-E.
Last but not least is the adjustability. I left this to the end because not all of the Scottsdale TR models are adjustable. Each model can be bought in a fixed length of 35 inches in most cases or as an adjustable length putter than can be extend or shortened from 31 to 38 inches. Whilst I was skeptical about adding adjustable length to a putter, I have been converted. The ability to precisely fit a putter to your height or putter technique was eye-opening. I am 6'3" and often crouch or hunch over when putting, possibly because I have become accustomed to reaching for shorter putters. I adjusted the Craz-E to around 36.5 inches, stood tall, and was surprised to find I was more stable and more consistent. Here's a quick explanation of how to adjust the putter. Insert the wrench into the hole on the adjustable collar below the grip. Once you have turned the wrench enough the telescoping shaft will loosen enough for you to alter the length. Sitting the putter on the ground, between your feet, lengthen or shorten the putter to the desired length. Turn the wrench in the opposite (left) direction to tighten or secure the putter into its new length. Voila. Start holing more putts! Some golfers prefer to have the putter either slightly open or closed to their eye. This therefore, allows you to set it to how you like it to look to your personal eye and stance. If it was fixed, this option would be taken away. It's a fair point. I would recommend if you like your putter square at address, choose a fixed length. 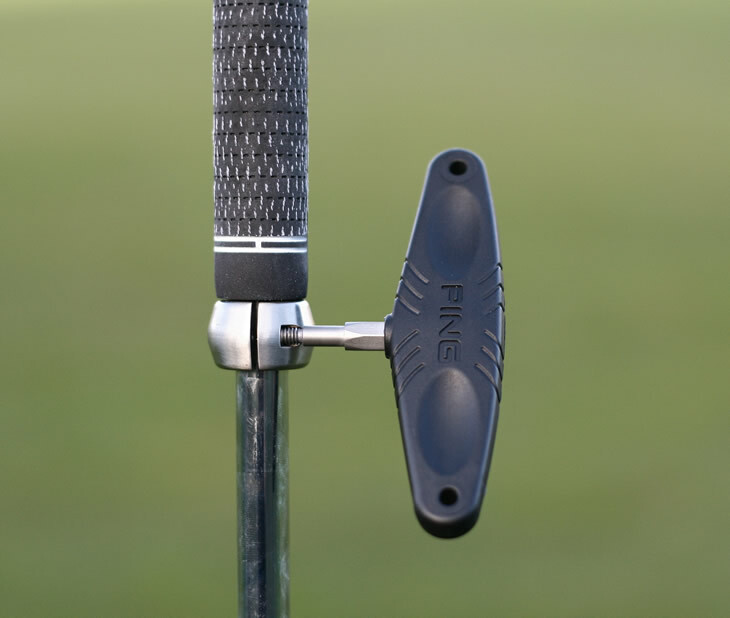 If you are the type of player that is open to adjusting the face angle, and want the benefit of adjusting the length, the adjustable option will suit you greatly. Another aspect of the adjustability shaft is a little extra weight. The shaft is longer and the adjustment collar also adds weight, so in your hands the putter feels noticably heavier nearer your hands. It won't affect many players, but it is worth trying before you decide if the adjustable option is right for you. Regardless of these minor qualms, it didn't impact the performance, look or feel of the putter. Once I had it set the way I wanted, the results spoke for themselves. Ultimately, I was impressed by the Craz-E. The new, dark Scottsdale looks and impressive TR face surprised me and whilst I wasn't sure the shape and features would be for me, I was officially converted. The straight leading edge, thicker grip, adjustable shaft and consistent performance were impressive. I recommend that if you are looking for a new putter, have £150 to spend and want more consistency on the greens, try the Scottsdale TR range. Head shapes can be a down to personal preference, but if you have any draw towards the Craz-E model, I can assure you, you won't be disappointed. I just bought Ping Scottsdale 2. Took it to the tournament without a single stroke before the tournament, I made 8 brides for the 2 days.Thank you Ping for creating such a nice putter - keep up the good work. Ping add the Anser T, Craz-E and Senita B to the Scottsale TR putter range.